UNB’s newly formed Computing Science Creative Space (CS Square) Centre announced Catlin O'Donnell, software engineering freshman, as the winner of its first-ever student pitch competition. O’Donnell received $2,000 in cash to develop his business idea with the help of business advisors and potential investors. 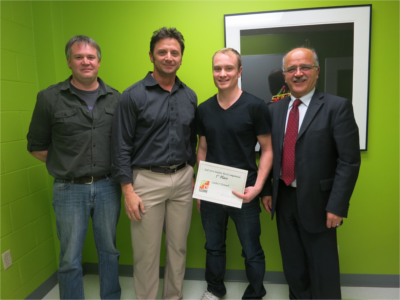 He also received free entry into the Startup Weekend Fredericton taking place in March. The first pitch competition, held on November, is one of many initiatives by the CS Square aimed at promoting innovation and entrepreneurship among computer science students. Eight teams of computer science students enrolled in the competition and went through entrepreneurship training at CS Square. Each group was coached in how do develop an idea into a business and how to sell their ideas to potential investors. Six of the teams succeeded to transform their initial business ideas into business plans and presented these plans to a panel of judges from investors, industry and faculty. O’Donnell said taking part in the inaugural CS Square Pitch Competition was a tremendous learning experience. CS Square strives to create an environment for students, faculty and local industry to meet, collaborate and exchange innovative ideas. The success of the pilot pitch competition held this semester opens up new opportunities for students to become young entrepreneurs. Recently, UNB was named by Startup Canada as the country’s top university for entrepreneurship. This is because, for years now, there has been a deliberate focus on nurturing a culture of entrepreneurship, which involves mentorship, collaboration, research – and taking chances. There are a number of programs in place to provide UNB students with an opportunity to bring their ideas to life. Our students and faculty have created new companies that have gone on to create commercial success, creating millions of dollars in new wealth, and spawning new ideas and new ventures. Learn more about entrepreneurship at UNB.